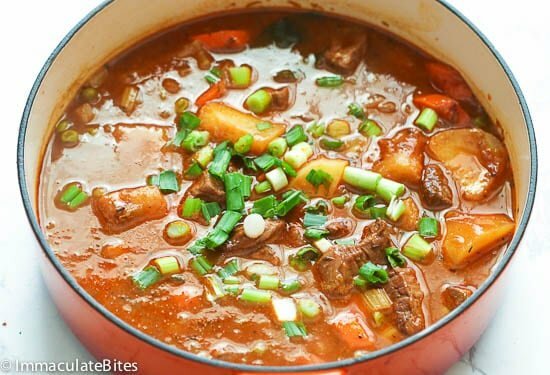 Guinness Beef Stew – hearty comforting stew with chunky hunks of beef slowly cooked and simmered in a rich and flavorful Guinness gravy sauce. Hands off easy and so tender, you can eat it by the spoon! My body has started to react badly with the colder season. I’m struggling with a bad flu as of writing and is scheduled to visit a good friend across the country tomorrow. But I won’t let this flu stop me from writing how extra incredible this Guinness Beef Stew recipe here is for today. You all deserve this on your dinner table – cold season or not. 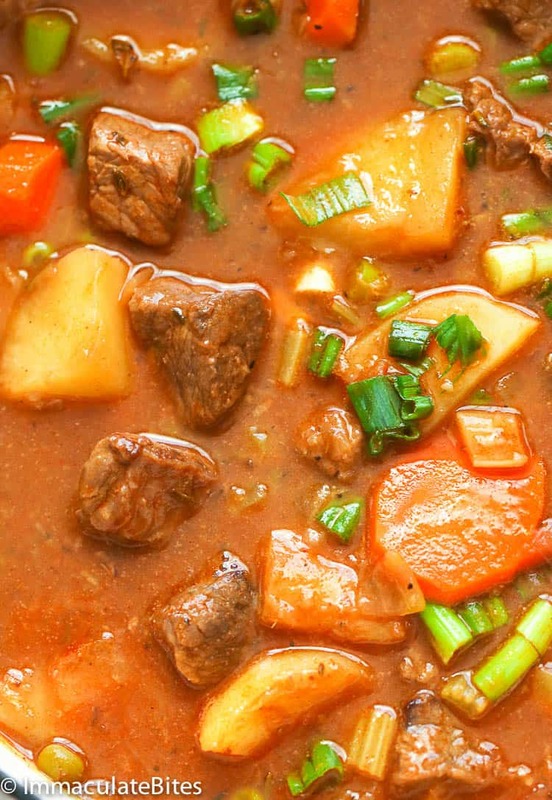 What’s in a Guinness Beef Stew? 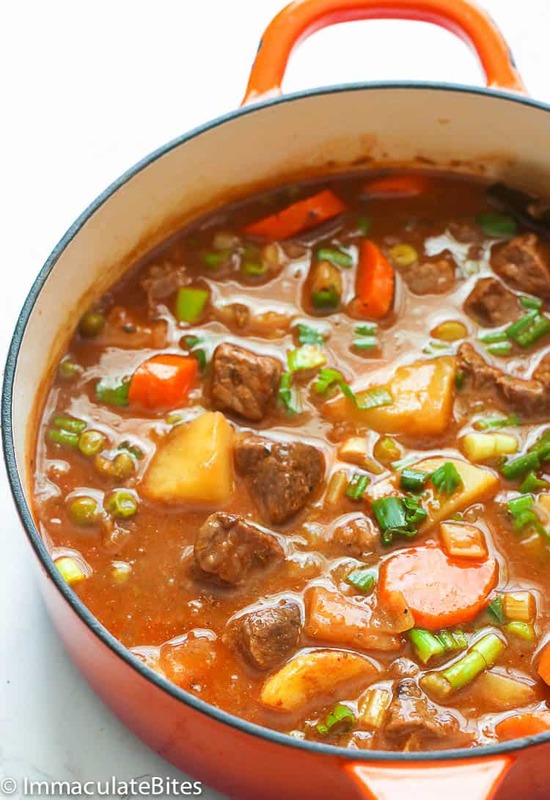 Just like this Slow Cooker Beef Stew, this Guinness Beef Stew is also packed with chunky beef and vegetables. It has large chunks of carrots, potatoes, peas and celery. Most common veggies you can see in a beef stew. But what makes this recipe a stand out is the popular Guinness beer that makes the gravy sauce out of this world DELICIOUS! Guinness is a popular traditional Irish stout beer that originated in Dublin, Ireland and one of the most successful beer brands worldwide. It’s burnt-like flavor from malted barley and roasted unmalted barley makes any Guinness-infused dish so rich just like my surefire hit Guinness Chocolate Cake. Every inch of the meat and vegetables are hugged in a complex, aromatic, rich, thick sauce. 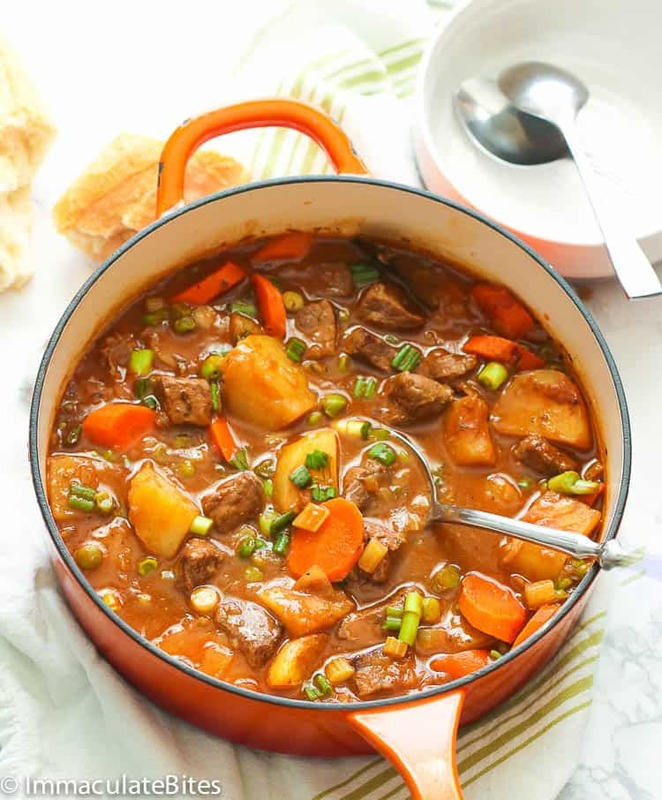 I couldn’t think of anything better to share with you today other than this beef stew here is the MOST EPIC STEW there is! Not to mention how easy it is to prepare. 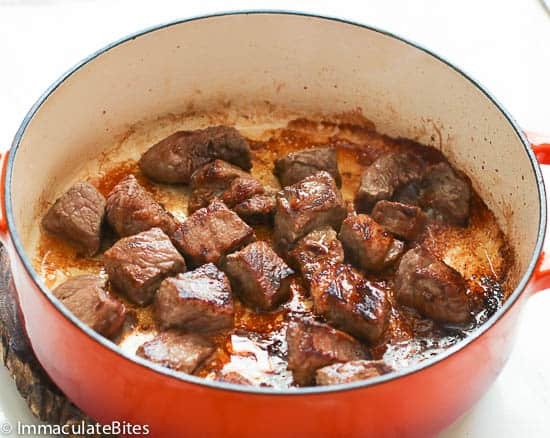 Although you can skip the browning part and start by sauteing the vegetables as the beef cuts would be slowly cooked anyway, however, I can’t emphasize enough how the browned beef stew cuts add a deeper flavor into this recipe. So if you can, don’t skip that part, please! You don’t have to worry ’cause everything in this recipe happens in the same pan for easy clean up. Once you have browned the recipe and the veggies, you then start working on the gravy sauce starting off with cooking the flour. Some recipes won’t call for adding flour which is basically okay if you want watery-like kind of sauce. 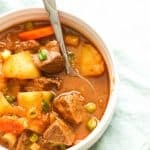 Can I make this beef stew without using Guinness? 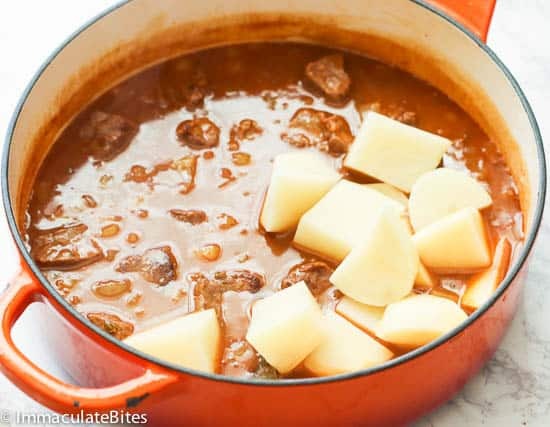 For those who are reluctant with anything alcohol in their dish, the rich Irish beer flavor in the beef stew beautifully melds into an amazing gravy sauce as it cooks. 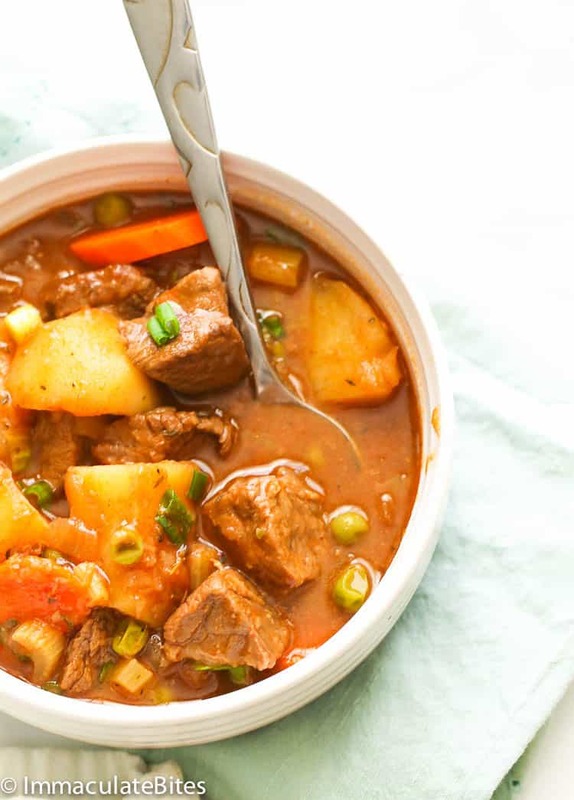 If you can’t find any Guinness in your area, any stout beer brand would work, but it wouldn’t be as flavorful as this Guinness Beef Stew. Unfortunately, there is no non-alcoholic substitute for this recipe. Sprinkle it with black pepper and a hint of parsley alongside with a basketful of bread to mop the sauce clean. Laddle up and enjoy! I highly recommend that your brown the meat first for a deeper flavor. That distinct flavor and slight crust does not compare to simply throwing raw beef cuts in the pan. Use Yukon potatoes as they are buttery and won’t fall apart easily after hours of slow cooking. 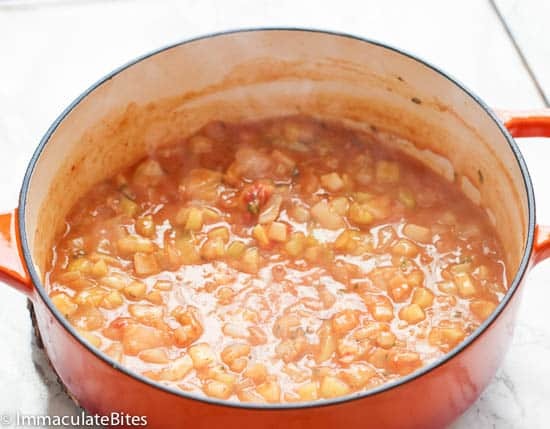 Adding tomato paste in this recipe instead of diced or crushed tomatoes minimizes liquids in this recipe while adding a bold flavor. For a gluten-free option, you can skip the flour and instead use cornstarch or cornflour mixed with water to thicken the sauce. Guinness Beef Stew - hearty comforting stew with chunky hunks of beef slowly cooked and simmered in a rich and flavorful Guinness gravy sauce. Hands off easy and so tender, you can eat it by the spoon! In a large Dutch over-medium heat, sauté bacon until brown and crisp. This may take about 5-6 minutes. Season stew beef with salt and pepper to thoroughly cover all sides. Add about 1-2 more oil .. Add stew beef and brown well, turning once, about 2 -3 minutes per side, until beef lightly browns. Do not overcrowd pan. Cook in batches, if necessary. Remove and set aside. Add onions, garlic, thyme, bay leaf and celery to the skillet. Stir for about 2-3 minutes until onions is translucent. Then add flour and cook for another minute. Pour in about 1-2 cups water. Add, paprika, tomato paste and bouillon. Continue stirring , then add Guinness, brown sugar , brown beef . Add more water or broth to the pot scrape all sides. Make sure it covers the food. Bring to a boil. 20 minutes before stew is ready throw in potatoes, carrots and peas; adjust seasonings according to preference. 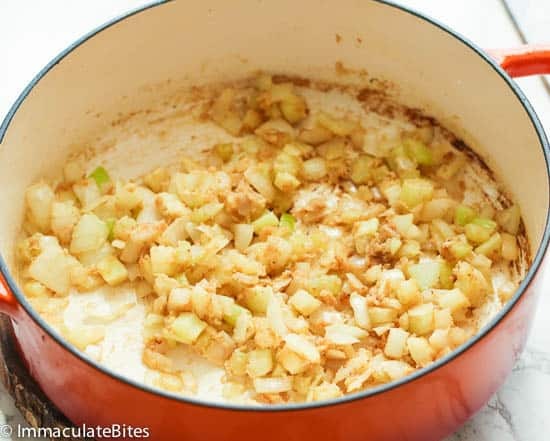 Cover and cook on until potatoes are tender. Remove, garnish with , bacon and parsley if desired and serve with bread. In a large Dutch over-medium heat, sauté bacon until brown and crisp. This may take about 5-6 minutes. 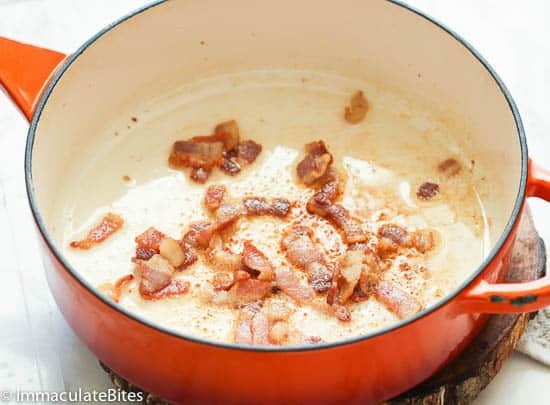 Remove bacon from skillet and transfer to a plate. There will be some bacon drippings left in the pan (about 1-2 tablespoons). Season stew beef with salt and pepper to thoroughly cover all sides. Add about 1-2 more oil. Add stew beef and brown well, turning once, about 2 -3 minutes per side, until beef lightly browns. Do not overcrowd pan. Cook in batches, if necessary. Remove and set aside. Add onions, garlic, thyme, and celery to the skillet. Stir for about 2-3 minutes until onions is translucent. Then add flour and cook for another minute. Pour in about 1-2 cups water. Add, paprika, tomato paste and bouillon. Continue stirring. Then add Guinness, bay leaf, more water or broth to the pot; scrape all sides. Make sure it covers the food. Bring to a boil. 20 minutes before stew is ready, throw in potatoes adjust seasonings according to preference. Remove, garnish with parsley and serve with bread. Cover and cook on until for about 10 minutes. After 10 minutes, add carrots and peas, adjust seasonings and continue cooking until potatoes are tender. Finally, add green onions, if desired, and serve warm with bread. This is an excellent recipe! I made it in the insta-pot, which is a little tricky the first time. I recommend Yukon Gold potatoes, They seem to hold together better in any soup or stew. And for the perfect taste only use Guinness Beer. Thanks, This is very good eats! I included in my second batch this am. I plan to try your chicken stew next. Thanks for taking time out to share this. Glad to hear it worked out well for you. Honestly as someone who loves beer(stouts being my fav) with a bit a research you can easily find a Guinness alternative. While Guinness is good and incredibly popular it’s actually a very light stout. I would love to try this with a more robust stout or porter. Thanks for taking the time to share your thoughts. Do let us know how it works out for you. Hi, Imma! 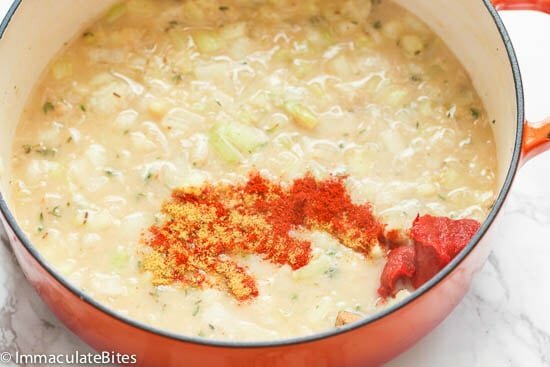 This is a great recipe – so rich and flavorful! Thank you for sharing! 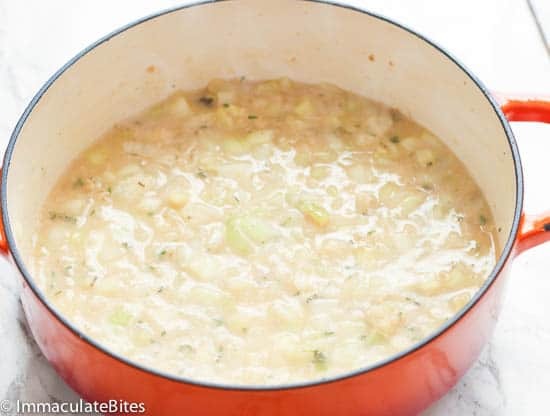 Just one thing I’d note – as one who often has to cook for a celiac intolerant – things made with beer are generally not gluten free, whether you use flour or cornstarch to thicken the sauces. The beer itself usually contains glutenous proteins. For the rest of us, tho… Yum! Imma this is a great winter comfort food. My first time of cooking with beer. Wish I could upload my pictures. Highly recommend for the cold winter. Awesome! So happy to hear you enjoyed Cletus. Thanks for taking time out to provide feedback. I love using my crock pot for stews, Could you throw the mixture into a crock pot to simmer a few hours? If so when would you add the potatoes and veggies? Yes, put the potatoes and veg in about an hour before the end of cooking.